Hiya guys! I normally don't say this on a Monday, but I am having like the best day ever. I want to take a second away from this post to thank all the ladies that got together for a 'get well soon' collaboration. It's by far the sweetest thing anyone has ever done for me, thank you from the bottom of my heart. All that sappy talk aside, let's get into this polish post. Today I'm sharing Sparkleistas from My World Sparkles Lacquers, which is the exclusive fan group polish. 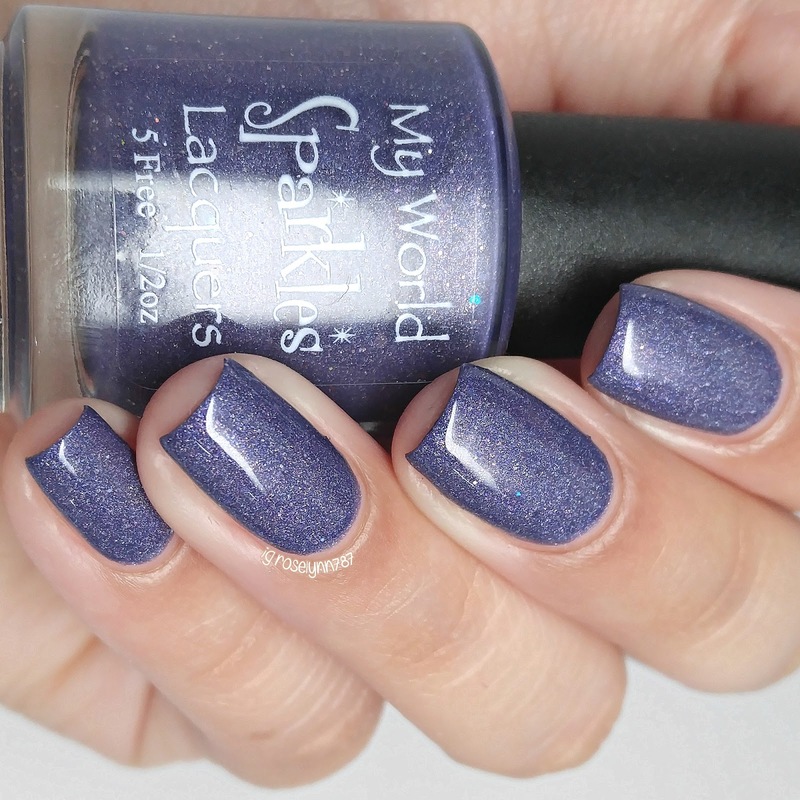 Sparkleistas from My World Sparkles Lacquers is available for purchase now as a pre-order. Once the release date is set, all pre-orders will be shipped out on that date. This polish was created exclusively for fans of the indie, so in order to see the shop listing, you must be part of the Facebook Fan Group! What are you waiting for? Go join now! Sparkleistas can be described as a rich purple linear holographic polish with silver micro glitter and larger holo glitters. Definitely in the one-coat wonder family if you use a thicker coat. Personally I always tend to apply my polishes with a lighter hand so I opted for a super thin second coat. Formula has a smooth and very opaque application with a great consistency. The intense glitters due make this polish dry to a bit of a gritty finish, but topcoat easily smooths it all down. Shown here in two coats plus topcoat. I also have a video swatch and review for you guys available now on my YouTube channel. Be sure to share and give a thumbs up if you'd like to see more swatch videos from me in the future. As I briefly mentioned in the video, all of the bottles will be numbered. The orders will be packaged as they are received, which means the earlier you place your order the lower the bottle number. It's a very cute touch to emphasize the exclusively of the polish, feels very like a 'collectors edition' type of thing. Overall I'm completely loving this shade as I'm a huge fan of the color purple. Plus it's holo and I mean what polish girl doesn't love a holo?! Each full-size bottle (15mL) retails for $10.00. But remember guys, this polish is a fan exclusive, so in order to see the shop listing, you must be part of the Facebook Fan Group! Don't miss you chance on owning this beauty. Go join the fan group, polish aside it's actually a really friendly and fun community to be a part of. I love this polish, its super cute! Your swatches always kill me. The best! A great shade of purple! That is such a beautiful polish, and great video! Loved your video! Love the polish, too. Such a gorgeous dusty purple! Such a pretty color. I totally didn't realize I was in that group already, I should order it. ZOYA SUMMER 2016 NOW AVAILABLE on ZOYA.COM!